Here are some of the answers to your "Marital Problems", from our expert Vasireddy Sreenivasa Rao. Q: How will be my married life? A: I think time has come for the marital tie. By the second half of 2001, you may be blessed with marital status. Married life will be smooth and fulfilling, as per the chart sent by you. Q: When will I get married and how will be my married life? A: There may be further delay, till the end of 2001. But marriage is not denied. With some attitude adjustments from both sides, you can run a smooth family life. Q: How will be my would-be wife, (her beauty, character, education and financial status). When will marriage take place approximately? A: 7th lord Saturn is in the lagna in the company of Mars, aspecting the lagna lord in the 10th. The lady in your life is a rigid disciplinarian, fixed in her views which are largely out of date. An inner mistrust or reserve will hold her back in day-to-day life. She believes her way is the only way. Q: My wife is a mangalic. My health is not good ever since marriage in 1981, why? A: You have not sent your wife’s horoscope to ascertain whether she is a mangalic or not. Your 6th house is afflicted by three first-rate malefic planets without any benefic aspects. You cannot blame somebody else for your misfortune. Q: When will marriage take place and with what type of boy? A: Marriage is likely by the second half of 2001, coinciding with Jupiter’s transit into Gemini. Mutual understanding may be missing. The boy may be puffed-up with self-importance. He will be boastful, domineering and an incorrigible spendthrift. He may over-eat, thus have health problems, which he cannot understand. He may be constantly borrowing money from friends and will be always in debt. You want more? You tend to avoid responsibilities and project your troubles on others. Life goes on like this. Select a matching horoscope. Q: What type of a girl is destined for me and when will marriage (love or arranged marriage) take place? A: It seems that you have somebody in your mind, but how far you will be successful is doubtful. Marriage will be by the end of 2001. She may be impatient, and argumentative. You are a serious-type, with good powers of observation. You are burdened with unavoidable responsibilities. Select a matching horoscope. Q: When will I get married and to what type of a boy? A: Marriage may take place by second half of2001, but select a matching horoscope. There may be misunderstandings in sharing of household responsibilities. The boy will want to remain free. He will be too independent and unconventional. Q: We are newly married. Please discuss if there are any doshas in begetting children? A: Both horoscopes possess 5th house blemishes. 5th lord is posited in the 8th in both the charts without any benefic aspect. Either there may be still births/miscarriages/ or delayed births. Distribute fruits/sweets etc to children at orphanages whenever possible. Q: Please discuss my married life? A: You are pessimistic. Success comes only after prolonged hard work. Your timing in important matters never seems to be correct. The lady may be stubborn, unable to see another person’s point of view. With some attitude adjustments, you can lead a smooth life. Q: How is my married life? A: Must be satisfactory, She must be very ambitious. She can shoulder all responsibilities and remarkably ersistant. She will toil days and nights if there is a goal to be reached…..HOW ‘S THAT ? Mr. Tej Ratan Kothari. Berhampur. Q: What type of girl is destined in my marital life? A: She will be cheerful and witty with pleasing manners and articulate speech. It will be a reasonably good married life. Q: How is my married life.? A: Love marriage is not indicated in your chart. The lady in your life will be passionate, exciting and brilliant…..above all stylish!!! Q: Any cure astrologically for baldness? How will be my would be partner? A: Try acupuncture to grow more hair on your head. There is no known astrological solution for this. There is kalatradosha in your horoscope. Select a matching horoscope. Q: Is there a second marriage in my life? Or is it better to remain like this? 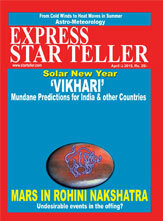 A: A perfectly matched horoscope can help you and get it scrutinised by a competent astrologer who knows his stuff. Q: Is there any prospect of having healthy children ? A: Jupiter is blessing your 5th house and 5th lord, hence children are not denied from your side. 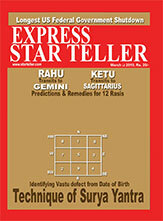 5th house in your wife’s chart is occupied by Ketu and is aspected by Saturn from the 8th. This could be a minus point in her chart. Perform Sri Mahaganapathy Homam at your residence. Mr. Neeradh Rajdan, New Delhi. Q: How are my marriage prospects? I have a detached outlook towards marriage. A: Lagna lord is in the 7th aspected by Jupiter, Saturn is aspecting the 7th lord. You cannot escape marriage. Saturn, the lagna lord, in the watery Cancer sign, is like dripping bread in water. Your discipline, morality and persistence will largely get affected. This made you a detached personality. This may not workout in the long run. You may have to make amendments to your attitudes after marriage. Q: Married for three years, had three abortions, any prospects of having children? A: There may be a possibility of a child next year and continuous monitoring of medical follow-up will be of much help.